Since June 16, 2015, the day that Donald Trump descended a golden elevator and announced he was running for president, he’s criticized the media nearly 1,000 times on Twitter. New York University master’s student Stephanie Sugars started tracking Trump’s tweets last spring, while working as a researcher for the Committee to Protect Journalists. And she kept the effort up even after she left the committee. Over the past two and a half years, she found, Trump posted 990 tweets criticizing reporters, news outlets, or the “Fake News Media” writ large. Another 350 or so tweets attacked specific news organizations: The New York Times, CNN, and — in a twist — Fox News were Trump’s top targets. Many of the tweets attacking Fox News, however, were posted prior to Trump’s victory in the Republican primaries and while Kelly remained on the network. Trump also used the term “fake news” more than 140 times, the team found. “Ratings” are touted approximately 45 times, usually to suggest that news outlets are falling behind in rankings because they’re not being “nice” enough to Trump. Keep in mind, Sugars’ spreadsheet also doesn’t include Trump’s non-Twitter public statements attacking the media — which he makes frequently. 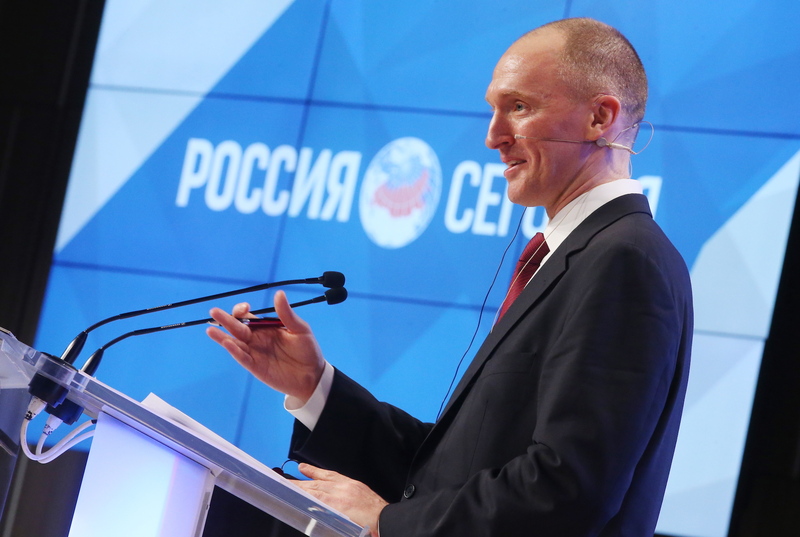 When then-candidate Donald Trump first introduced Carter Page as a member of his foreign policy team, he took special care to note that Page had a Ph.D. But that accomplishment might not be as impressive as its sounds: Page, who is now at the heart of the multiple investigations into whether Team Trump colluded with Russia during the 2016 election, needed three tries to secure that doctorate degree, the Guardian reported Friday. His in-person test didn’t go much better. Page tried again in 2010. This version was a “substantial improvement,” the Guardian reported, but still not good enough. And while it’s not uncommon for doctoral students to fail on their first try, failing twice is much more unusual. Andrusz noted that, over the course of his 30-plus years in academia, Page was the only student he’d ever had to fail twice. In the end, Andrusz and his fellow examiner, University College of London professor Pete Duncan, never gave Page a passing grade. Instead, they resigned after Page accused the pair of being “anti-Russian and anti-American,” Andrusz recalled. Page also said their actions were “far more destructive than anything I have personally experienced in my 39 years on this planet,” and compared his struggles in academia to those of Mikhail Khodorkovsy, a Russian oligarch who spent years in a Soviet-era labor camp in Siberia. Apparently Donald Trump does believe in global warming — at least he does when it might threaten one of his beloved golf courses. Trump got the green light on Thursday to build a 38,000-ton sea wall (he’s getting a wall after all!) at the Trump International Golf Links Doonbeg in Ireland. The wall, consisting of a pair of barriers extending 2,000 feet to protect sand dunes from erosion, has sparked anger from local campaigners over the potential environmental impact. Remarkably, the club’s application documents for the wall cite global warming, specifically rising sea levels and extreme weather, as a justification for building the structure, according to Politico. Trump has famously denied climate change is real, calling rising temperatures a hoax created by the Chinese in a 2012 tweet. Environmental groups, including Ireland’s Green Party, have complained the wall would damage coastline ecology and harm wildlife. An original plan for a 1.7-mile barrier was rejected in 2016. The Trump Organization said not building the barrier would threaten the course and therefore local jobs that depend on a thriving club hotel. Irish campaigners have vowed to appeal Thursday’s decision in the coming weeks. Trump has a history of antagonism with the environmentalists in the British Isles. In a 2011 letter to former Scottish First Minister Alex Salmond, he complained that a bank of wind farms was having an “adverse visual impact” on his Royal Aberdeen Golf Club. The House gave America — and themselves — a big beautiful Christmas gift Thursday when it rushed through the passage of a spending bill 24 hours before the deadline, bringing the government one step closer to averting an all-out shutdown. After successfully pushing back the due date, the legislators headed out for their well-earned vacation — they won’t be back in session until January. The Republican-led House passed the stop-gap spending bill by a vote of 231-188, ensuring the government will be funded through Jan 19. Decisions on bigger ticket items like defense and immigration were, believe it or not, booted to after the New Year. The Senate also approved the measure later on Thursday — see ya next year! A “so-called” federal judge, who President Trump once publicly shamed on Twitter, is back in the ring, again deliberating whether to halt the Trump administration’s refugee ban. The ACLU and Jewish Family Services asked the U.S. District Court in Seattle for an injunction, challenging a portion of the administration’s ban, which prevents refugees from entering the U.S. to join family members already in the country. Oral arguments were heard Thursday. U.S. District Judge James Robert, whose qualifications Trump previously drew into question on Twitter, is presiding over the case. In February, Robart temporarily blocked Trump’s first iteration of the ban, aJan. 27 executive order that restricted entry from seven predominantly Muslim countries. President Trump in October issued an executive order that banned the entry of refugees and their families from Egypt, Iran, Iraq, Libya, Mali, Somalia, Sudan, Syria, Yemen, South Sudan and North Korea. The administration has argued the latest iteration of the ban is justified by national security issues, while the ACLU and other refugee advocates say it violates constitutional law and goes beyond presidential authority. The ACLU’s case was filed on behalf of a plaintiff listed as Joseph Doe, a Somali-born legal permanent resident of the U.S. who is fighting to have his kids and wife join him from Kenya. Robart says he will decide on the case before Christmas. The fruits of Donald Trump’s deal-making prowess were in full flower at the United Nations on Thursday, where his blustering threats over a symbolic vote reportedly caused even one of America’s closest allies, Canada, to change course and turn its back on his demands. In a stinging rebuke, the UN general assembly voted overwhelmingly, 128-to-9, to reject Trump’s decision earlier this month to unilaterally recognize Jerusalem as Israel’s capital. Thirty-five countries abstained. Before the vote, Trump had threatened to cut “billions” in international aid to countries that dared to vote against the U.S. In the end, the U.S. was opposed by longtime allies like Germany and the UK, and by strategic partners and major recipients of U.S. foreign aid like Iraq, Egypt, Afghanistan and Jordan. Canada had been considering voting in support of the U.S., but decided to abstain in the wake of Trump’s threats to avoid looking like an American puppet, Israeli journalist Barak Ravid tweeted. Behold: The Art of the Deal. Donald Trump threatened Wednesday to withdraw billions in U.S. aid to countries that vote against his decision to recognize Jerusalem as Israel’s capital in Thursday’s U.N. General Assembly session. Member states are expected to pass a symbolic resolution rejecting the change of status to the holy city. Speaking at a cabinet meeting Wednesday, Trump was defiant. “For all these nations, they take our money and then vote against us. They take hundreds of millions of dollars, even billions of dollars and then they vote against us,” he said. His comments echoed a warning from U.S. Ambassador Nikki Haley that she would be “taking names” of those who voted against the Jerusalem move. Trump’s decision to break with international consensus and recognize the disputed city as Israel’s capital has left it isolated and facing a wave of international criticism. The issue is set to be revisited in an emergency session of the 193-member General Assembly Thursday, where no country holds veto power. If the assembly passes the symbolic resolution, it would be an embarrassing loss to the U.S. on the world stage. Haley in U.N. shakedown ahead of Jerusalem vote: We’ll be "taking names"
The world’s diplomats can consider themselves on notice. Donald Trump will be watching closely when the U.N.’s general assembly votes on the status of Jerusalem Thursday, and U.S. Ambassador Nikki Haley will be “taking names” of those who fall out of line. The terse warning was made in a letter from Haley to other countries, including U.S. allies in Europe and elsewhere, ahead of the vote on a symbolic resolution rejecting the Trump administration’s recent recognition of Jerusalem as Israel's capital. “As you consider your vote, I encourage you to know the president and the U.S. take this vote personally,” read the letter, according to multiple media outlets that have viewed the document. Haley’s belligerence reflects increasing U.S. frustration at its isolation on the Jerusalem issue. Trump’s decision to shatter decades of diplomatic consensus and recognize Jerusalem as Israel’s capital sparked a wave of international condemnation, reflecting concerns that it upsets the fragile status quo in the region and will be an obstacle to peace. The status of the disputed city, holy to Judaism, Islam and Christianity, lies at the heart of the Israeli-Palestinian conflict. Claimed by both sides as their capital, its final status is to be negotiated as part of the Middle East peace process. All countries currently maintain their Israeli embassies in Tel Aviv, though Trump has promised to start the process of relocating the U.S. embassy to Jerusalem. On Monday, the U.S. was forced to cast its first veto in the U.N. Security Council in six years to block a vote attempting to nullify moves to change Jerusalem’s status. On Thursday, the issue will be revisited in an emergency session of the 193-member General Assembly, where no country holds veto power. A draft of the non-binding resolution calls on the body to declare Washington’s move “null and void,” and insists that countries avoid any decisions that could alter the status of Jerusalem, the Guardian reported. For all Haley’s bluster, it’s unlikely to have much effect. Bloomberg reported that the diplomats it had spoken to said her letter would have little impact on their vote. Trump didn’t think Neil Gorsuch was grateful enough to President Trump for nominating him to the Supreme Court, according to the Washington Post. He even considered withdrawing his nomination. Trump spent eight months bragging about his great nomination of Gorsuch, who was eventually confirmed to the Supreme Court in April. But privately, Trump worried Gorsuch wouldn’t be “loyal” enough, sources told the Post. The trouble reportedly started when the former 10th Circuit judge criticized Trump’s attacks on the judiciary after a judge blocked his travel ban. After Gorsuch told Sen. Richard Blumenthal that he found Trump’s attacks on the judicial branch “disheartening” and “demoralizing,” the president was furious — one aide called his reaction an “explosion,” according to the Post. Another said Trump told staff he knew plenty of other judges who would want the job. Not long after the Post’s story published, Trump lashed out on Twitter with his favorite media insult: fake news. Whatever concerns Trump had about Gorsuch eventually subsided, but it’s clear loyalty — or perceived loyalty — is the price of doing business with the president. No one knows that better than former FBI director James Comey, who said he was fired in May because of his unwillingness to pledge loyalty to Trump. Donald Trump was warned by the FBI that foreign powers including Russia could try to infiltrate his presidential campaign, according to NBC News. Government officials told the broadcaster senior FBI counterintelligence officers gave Trump and Hillary Clinton briefings once they became their parties’ nominees. The briefings, offered as standard, make clear the potential threats faced by campaigns from foreign spies. At the briefings, Trump and Clinton were encouraged to inform the FBI about any suspicious approaches to their campaigns, officials said. By the time of Trump’s briefing in late July or August, at least seven of his campaign officials had been in contact with Russians or people linked to Russia, and there is no public evidence that any of those contacts were reported to the FBI, NBC reported. Despite the head’s up from the FBI, the U.S. intelligence community believes that Russia was still able to successfully interfere in the election, hindering Clinton’s campaign and helping to swing the results in favor of Trump. A number of congressional probes have been launched as a result, as well as an investigation by special counsel Robert Mueller. Trump has repeatedly denied any collusion between his campaign and Russia. A White House spokesman downplayed the significance of the NBC report. Four individuals have been indicted in Mueller’s probe to date, including Trump’s former national security adviser Michael Flynn, and former campaign aide George Papadopoulos. Both have pleaded guilty to lying to the FBI over their interactions with Russians. While Trump has refused to concede that Russia meddled in the elections, and has repeatedly expressed his admiration for Vladimir Putin, his first official National Security Strategy, released Monday, acknowledges Moscow as a growing threat to the U.S.
President Trump’s pick for federal judgeship who was widely mocked for failing to answer basic legal questions at his confirmation hearing just became the latest nominee to drop out. Matthew Petersen was a member of the Federal Election Commission who was being nominated to the U.S. District Court for the District of Columbia. In his withdrawal letter to Trump on Monday, he called his nomination a “distraction” and said that it wasn’t fair to the administration. At his confirmation hearing last week, Petersen was unable to define basic legal terms and admitted he had never tried a case or argued a motion in court in his life. The video of his hearing, specifically a short clip in which he’s questioned by Republican Sen. John Kennedy of Louisiana, went viral. A specific death toll is still being tallied, but at least six were killed and dozens of Amtrak passengers were hospitalized after a train fell off a track and onto Interstate 5 late Monday morning. It’s not clear what the $7 trillion figure was, but Trump repeatedly promised on the campaign trail that he would revitalize the nation’s “crumbling” infrastructure, and he now claims a plan is almost finished. Trump wants to put forth $1 trillion to repair U.S. roads, bridges, tunnels, and railways. The problem: It’s not clear if any infrastructure plan actually exists, but he said last month that it would be presented after the tax bill passes. Another problem with Trump’s grand claims to inject efficiency back into U.S. infrastructure is that he isn’t exactly practicing what he’s preaching. Earlier this year, Trump’s transportation budget slashed funding for Amtrak, which weathered a $630 million loss in subsidies for long-distance routes. Trump’s budget also cut $928 million from transit construction grants. A later tweet from the president did express sympathy for the train-crash victims. Donald Trump won’t be able to retweet one of his favorite sources of anti-immigrant content anymore. It’s been suspended as part of purge of various far-right accounts. The official account of BritainFirst, a U.K.-based organization on the right fringe of British politics, and the accounts of its senior leaders, including Paul Golding and Jayda Fransen, were suspended on Monday. In late November, Trump retweeted three videos that Fransen, BritainFirst’s deputy leader, had posted, including one purportedly depicting a Muslim migrant assaulting a Dutch boy on crutches. The perpetrator, however, was neither Muslim nor an immigrant. The implementation of new rules at Twitter designed to limit harassment and abuse prompted the purge. Under them, any connection to violence, including incitement of violence, is grounds for suspension. Given the history of BritainFirst’s leadership, its suspension isn’t a surprise. Golding and Fransen are scheduled to appear in court in January for “using threatening, abusive, insulting words or behaviour” at a rally in Belfast this past August. Fransen was already convicted of “religiously aggravated harassment” for screaming at a hijab-clad woman in November 2016, and Golding served a stint in prison for breaching an injunction barring him from entering mosques. Representatives for Twitter did not immediately return a request for comment. Jared Kushner’s legal team is in the market for a crisis management public relations firm. When the Washington Post, which first reported the story, contacted Kushner for comment, his team offered a somewhat circular reasoning. “This inquiry from you about whether I am doing this is a good example of why we need one,” Abbe Lowell, Kushner’s attorney told the Post, adding that he was looking for a firm to handle inquiries for all of his high-profile clients. Lowell has quietly gotten in touch with at least two firms in the last two weeks, the Post reports, though one, Mercury Public Affairs, reportedly turned down Kushner’s bid. No official reason was reported, but its cooperation with Special Counsel Robert Mueller’s investigation after lobbying on behalf of Paul Manafort in the Ukraine probably played a role. Friendship knows no bounds, it seems. Take U.S. President Donald Trump and Russia’s Vladimir Putin, who have reportedly snuck a few more chats this year than anyone might have expected, given the downright awkward aspects of their relationship. Thursday marked the fifth occasion this year that the two leaders have spoken or met, according to Putin’s own count. Trump initiated the most recent phone call, according to the Kremlin, ignoring the ongoing federal probe encircling his White House to chat about the thing he loves most: Trump. According to the White House official readout, the two leaders both agreed that America’s booming stock market means Trump is doing a totally badass job as president. The call followed on Putin’s annual four-hour-long marathon press conference Thursday, in which he offered a full-throated endorsement of MAGAnomics. Trump, for his part, doesn’t spend much time on the fact that U.S. stock values nearly tripled under his predecessor, Barack Obama. Putin, of course, might genuinely believe that a booming American stock market equals #MAGA. Or the former KGB lieutenant colonel might have sized up his American counterpart, and decided that repeating Trump’s own self-compliments back to him would be the easiest way to curry favor with the leader of Russia’s former Cold War rival. Putin went on to endorse Trump’s view that the probe into Russia’s involvement in the 2016 U.S. presidential election is no more than “spy hysteria” fabricated by Trump’s political enemies. That, too, is a view Trump couldn’t more strongly endorse.